A superb new boat net from Shakespeare for 2014. 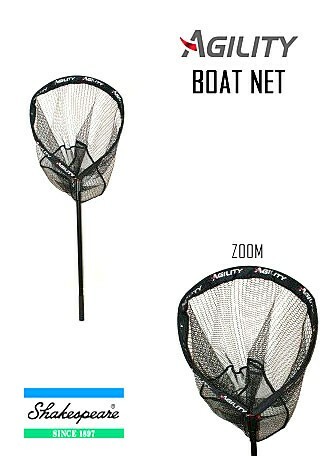 These nets have rubberised fish freindly mesh which is quick drying and low odour. Positive pin locking Aluminium Sliding block making the head removable for easy storage. 60cm Diameter slightly modified circular head with a bag depth of 50cm. The telescopic handle extends from 95cm to 173cm giving an overall extended length from 164cm to 240cm. This can be locked at any position to suit conditions. Travel length is appx 95cm. Looking to buy some Rod Stands, Shelters/Nets as part of a fishing gift? If you would like some advice on purchasing Rod Stands, Shelters/Nets, simply contact our expert fishing team, giving us either an email or phone number on which to contact you and we'll get back to you right away with the best advice and prices. FREE Delivery on all Shakespeare Rod Stands, Shelters/Nets over £100!! !